Who knew you could hide a dairy farm? Visiting Lusscroft in Wantage. Those Sussex county historical markers can be a boon when you're just wandering around, and we hit another good one in Wantage: Lusscroft Farm. The marker briefly told the story of Montclair stockbroker James Turner, who'd built a dairy farm there in 1914, with the goal of using the latest in scientific agricultural management principles. He later transferred the property and 250 Guernsey and Holstein cattle to the New Jersey Agricultural Experiment Station (good old Cook College), which later added a forestry study program and 4H programming, too. No gates blocked the entrance and the property was unposted, so we drove in. Odd that neither Ivan nor I had ever heard of the place, considering our combined knowledge of the state and what I thought was a pretty comprehensive understanding of NJAES properties. How did this one get past us? We drove up the hill on a narrow country road until we saw what can best be described as a complete farm: barn, stable, house, you name it. Various signs indicated the property's last use as a 4H facility, and the vestiges of a summer camp, including an infirmary and staff housing, came into view. We parked next to one of the buildings and got out to take a look. A nearby bulletin board told us that Lusscroft is now part of High Point State Park, but it still holds farming ties through an association with the State Agricultural Development Committee. As we looked around, the place got a bit less deserted looking -- a late-model pickup truck or two were parked near the buildings, and an occasional vehicle would drive by, perhaps on the way to another part of the state park. Plus, the bulletin board announced a winter holiday event to take place in early December. Clearly people were keeping an eye on the place, and hopefully doing something to revive activity there. Later on, I visited Lusscroft's website and discovered there's a Heritage and Agriculture Association working to stabilize and ultimately restore the existing buildings. Their vision is to create a place where people can learn about farming, forestry and New Jersey's agricultural heritage, and I couldn't think of a better place to do it. The property is beautiful, with hills and dales, forest and meadow, and it would be a great place to spend a few days in the countryside. Equestrians can also take advantage of the stables there, it appears; the site notes that Lusscroft is the only state park facility to accommodate horses. Meanwhile, they're holding occasional events at the farm, including maple sugaring from the trees on site. Who knows? The revived Lusscroft could also reclaim status as a productive research facility. Back in the '30's, the farm was the first place in the world where cattle were artificially inseminated in the hopes of improving dairy stock. Even if it just opens peoples' eyes to the history and future of farming in New Jersey, Lusscroft will have made a big impact yet again. Yes, you read that correctly. A Civil War battle was fought in New Jersey. Granted, it was 13 years after the war had actually ended, but thousands of the Blue and Gray took to a field in Wantage to, once again, take arms. This time, of course, there was no ammunition and no bloodshed. It was the first Civil War reenactment in history. Site of the Deckertown reenactment. No doubt the McMansion is a more recent addition. Major General Hugh Judson Kilpatrick, a Sussex county native, invited veterans of both sides and their families to his Deckertown property for four days of festivities in August 1878, and over 40,000 arrived. The battle reenactment on the final day included cannon fire that could be heard up to 20 miles away. It's interesting that Kilpatrick arranged the gathering, because he had quite the reputation during the war itself. Known for aggression and bluster, he wasn't well regarded within the army because he was said to work his troops ragged. However, he might have gained some popularity from the reenactment, where a reported 10,000 barrels of beer were on hand for the participants. Did this guy know how to throw a party, or what? Looking at his history, it seems that maybe he realized he needed to do a thing or two to make some friends. It doesn't appear to have worked, at least not with voters. He made an unsuccessful run for U.S. Congress in 1880 after having lost the 1865 election for the governorship of New Jersey. However, his loyalty to the Republican party garnered him two stints as ambassador to Chile, where he ultimately died in 1881. Today there's little more than a historical marker along the roadside next to the stand-in battlefield. I wonder -- would reenactors today want to camp there? Dangerous, man-eating plants on state property? Carnivorous greenery? Sounds like something straight out of a Toxic Avenger episode set in the Meadowlands, but the real story is much different. The plants don't eat people, but they'll enjoy a good insect from time to time. And they're in what could be considered an unlikely location: within the highest elevation Atlantic white cedar swamp in the world, Kuser Bog at High Point State Park. The bog wasn't the first place on our schedule for the day. We figured we'd start at the Sunrise Mountain hawk watch, but no such luck. The one-way road to the appropriate parking lot was closed due to hurricane damage, and then the back route was also blocked off. I guess with budget cuts and whatnot, the State Division of Parks and Forestry is waiting till spring to repair the road. After all, if the road isn't open, you don't have to plow it in the winter, right? Granted, we could have hiked several miles of the Appalachian Trail to get to the watch, but Ivan suggested that we might be able to catch some hawk action at the High Point monument instead. Next stop: Kuser Bog. Now, most people would figure that wetlands of any kind - bog, swamp, marsh, you name it - would be close to the coast, or at least near a large body of water. Kuser Bog represents the remnants of a glacial lake that started to fill in, creating the alternately moist, mushy and dry terrain we see today. It's now host to Atlantic cedars up to 300 years old, plus rhododendron, black gum and hemlock trees, among others. It's also home to a (relatively) high-altitude collection of sundews and other carnivorous plants. We took to the trail looking for those plants. I didn't truly expect to see Audrey from the Little Shop of Horrors, but it would have been cool to see some sort of bug-eating activity. We noticed a lot of bright green sphagnum moss and some succulent-looking plants in the wetter areas of the bog, but we saw no blooms. I guess we were just too late in the season. Even without the marquee plants, Kuser Bog is pretty cool. At a point, the dirt path transfers over to a boardwalk over shallow water, lined on either side by vast cedars. We heard and saw only a few birds and the chatter of a squirrel or two, but at one point the walk was dampened by water that had apparently dripped off something that had jumped onto the boards. Too small to be a bear ... maybe a muskrat or something? Later at the High Point monument, Ivan pointed out a brownish green patch among the fall foliage below us. No doubt it was the bog, an interesting anomaly within the highlands ecosystem. If you want diversity of wetlands, New Jersey is certainly the place to be! The intersection of St. Georges Avenue (Route 27) and Westfield Avenue in Rahway is a busy one, and likely the real estate surrounding it is pretty valuable from a retail perspective. That's one of the things that makes the occupant of the northwest corner so remarkable. Instead of a bank or a Dunkin Donuts or drugstore, there's an imposing four-story wood colonial-era building. It's the Merchants and Drovers Tavern, once the hub of early Rahway and an important stop for travelers making their way between Newark and Princeton. Ivan and I visited during Four Centuries Weekend to get a fascinating look at travel and community in the times during and after the formation of the country. Enjoy a drink in the taproom - bar in the left corner! During colonial times, Merchants and Drovers was just one of several taverns along the roadways linking towns and cities in New Jersey and the other original 13 states. These taverns were often stagecoach stops and also served as a social gathering place where local residents could grab a drink and a meal. You might even say they were the internet or cable news outlets of the day, offering both news and commentary on current events. Often the largest gathering place in the community, taverns also hosted government meetings from time to time. Food and lodging prices were regulated to protect travelers from price gouging on the road. Merchants and Drovers itself opened in the 1790s at the crossroads of two roads that were busy even in those early days. Over time, the tavern expanded to four floors, with a tap room, parlors, an assembly room and 12 bedchambers. It continued in that function for well over a century before being given to the local Girl Scouts as a headquarters. 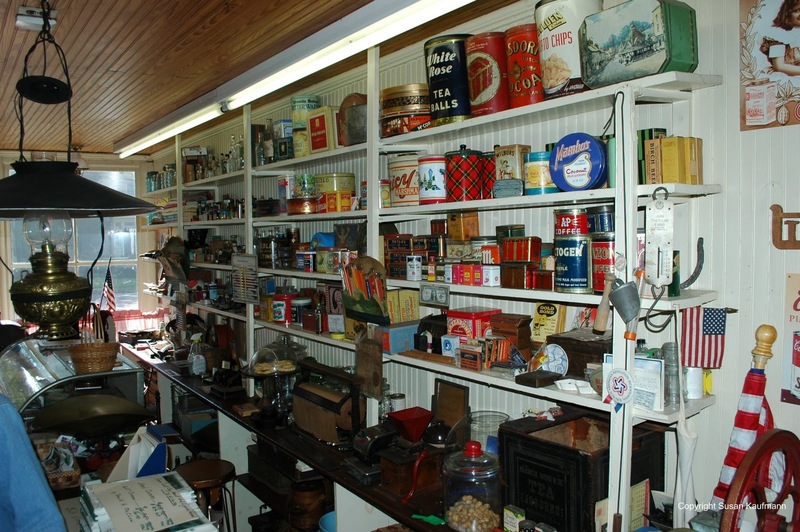 The Rahway Historical Society acquired it in 1971 and restored it in stages. Rooms were simple yet surprisingly big. 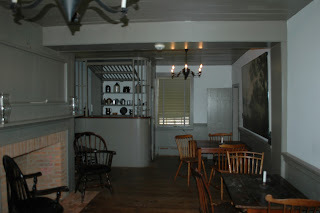 Today, the tavern looks much as it did in the 1820s, with an authentic bar and Colonial era furnishings, including rope-strung beds that conveniently fold upright for the daytime hours. As we walked around the three accessible floors, I was reminded of visits to tavern buildings in Colonial Williamsburg, but in its own way Merchants and Drovers feels more authentic. Maybe it's because nothing is finished to perfection, you feel as if you're walking into a heavily-used cornerstone of the community. It doesn't feel as if they've restored it to meet visitors' expectations of what a restoration should look like (i.e. back to the day the place originally opened), but as a representation of what it would have looked like had you visited in 1840. Well, except for the stairs leading to the second floor. They show the signs of a building in the process of settling, and we were tempted to go back to the car to find a golf ball or something to test our theory that they're listing a bit. Upstairs, the long (assembly) room has been given over to an informative exhibit explaining the role of the tavern in New Jersey's Colonial and post-Colonial society. A display on the entertainment available at taverns includes a reproduction of an Egyptian mummy that was shown at Merchants and Drovers by a traveling showman, and there's a simple yet fun board game that underscores some of the challenges a traveler might have faced in getting to the inn. And like today, inns were battling the war with bedbugs, as illustrated by a display showing infested bed linens and bugs encased in lucite. Fun for the whole family! As a bonus to the tavern, the adjacent Rahway Cemetery was also open to visitors for Four Centuries. We intended to make our visit quick but ended up spending about a half hour wandering through to find gravestones from colonial times through to the present. Most notably, Abraham Clark, signer of the Declaration of Independence, is buried there with his wife Sarah. He's memorialized with both a gravestone and a large obelisk dedicated in 1848. When I was growing up in Union, we all knew of a mysterious house on Morris Avenue across the street from Kean College. You couldn't see it because it was obscured by trees and shrubbery, but we knew that it was historically significant and that the woman who lived there was very important in Republican politics. Any time a Republican president came to town (and there were more than a few visits like that), there would be a private reception at the home. The rest of us, however, were left to wonder what was back there, behind the greenery. I was sure to tell Ivan that story before we visited the house, Liberty Hall, during Union County's Four Centuries Weekend. Vacant since the death of its last resident, Mary Alice Barney Kean, the home is now a museum and a fascinating look into the history of one of New Jersey's most influential families. For all but about a decade in the early 1800s, the house was owned by the Livingston/Kean family until it was taken over by the Liberty Hall foundation. I toured the house not long after it became a museum, and on that and subsequent visits, I enjoyed talking with docents about the house itself, the family and the belongings they left behind to represent almost two centuries of living there. Maybe it comes from that initial fascination I had as a kid, but I've always been drawn to learn more. The Four Centuries tour gave us an abbreviated view of the home and the family's history, which is kind of like telling a wine connoisseur that she can sample just one bottle from an extensive cellar. Built in the 1770s by Governor William Livingston as a country estate and family home, the home was setting to quite a number of distinguished Americans. Yes, George Washington visited, and Alexander Hamilton roomed there when he was a student in Elizabethtown. 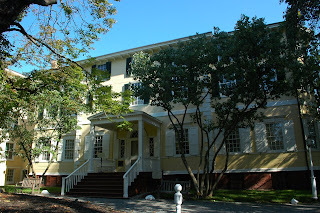 Livingston's daughter Sarah married the first U.S. Chief Justice, John Jay in the home. Other Livingston daughters married equally as well, cementing a family history that's sprinkled liberally with notables, even to current day. The Kean name, of course, is familiar to those who remember Governor Thomas Kean's two terms in the 1980's, but other Keans served in Congress and Trenton before him. The family also had controlling interest in the Elizabethtown Gas and Elizabethtown Water utility companies. One of the many things I enjoy about a visit to Liberty Hall is seeing some of the less-grand family possessions. These people threw virtually nothing away, and since they occupied the house without any gaps from 1811 on, they didn't have the opportunity most of us do to cull out useless belongings before a move to another home. As a result, a great deal of stuff accumulated over the years. For example, the dining room is currently decorated for a Halloween party, using authentic decorations and costumes found in the attic. Researchers have also found century-old receipts for coal deliveries. The rest of the grounds contain a lovely garden behind the house, as well as an orchard, carriage house and even a museum which holds a fire engine and firefighting memorabilia collected by one of the Keans. Much of the land adjacent to the Liberty Hall estate land has been developed as part of the Kean University campus, but you can still get a sense of what a lovely expanse it was when the family lived there. Liberty Hall is one of my favorite historical sites in New Jersey; I've only scratched the surface with this entry. Ivan and I will definitely be returning for the full tour, and I'll be sure to update you on more of what we learn. Part of our visit to the Eaton Store was a delightful conversation with a volunteer who shared her lifelong passion for baseball. 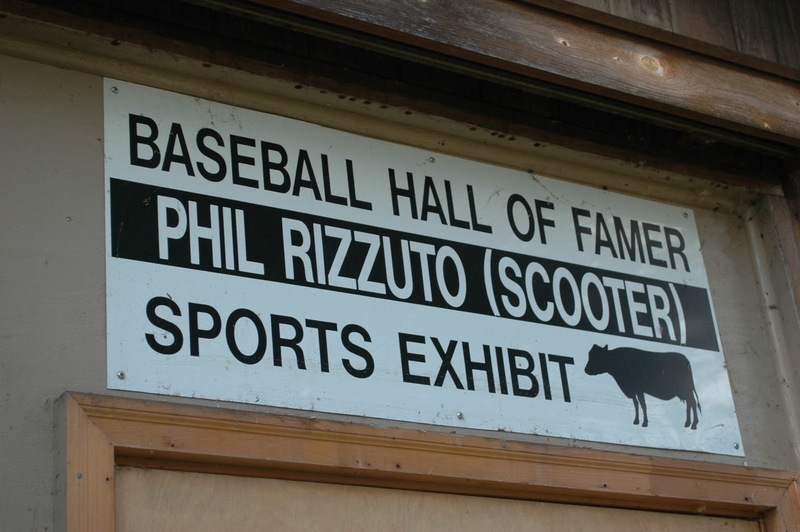 Fittingly, our next stop was to a barn just behind the store, where Hillside residents honor one of their own: Yankee shortstop and broadcasting legend Phil Rizzuto. Loyal Yankees listeners will remember that the Scooter often talked about living in New Jersey, and his dedication to his adopted hometown showed in his friendly demeanor around town. According to locals, he was always willing to stop and talk, and he was as genuine in person as he was on TV and radio. 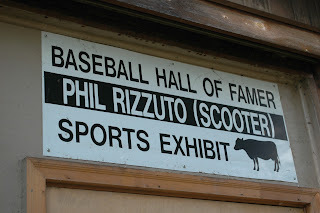 The Phil Rizzuto Museum takes up a relatively small space on the Woodruff House/Eaton Store property, but it's chock full of Scooter memorabilia. During our visit, Ivan and I were regaled with stories from a local resident who was 10 years old when he met Phil, starting a friendship that spanned the rest of Rizzuto's life. He walked us through a comprehensive exhibit of newspaper clippings that chronicles the Yankee legend's playing and announcing careers. Nearby a "Holy cow!" banner is posted, a memento recalling the six buses of Hillside residents who made the trip to Cooperstown to witness Phil's induction into the Baseball Hall of Fame. 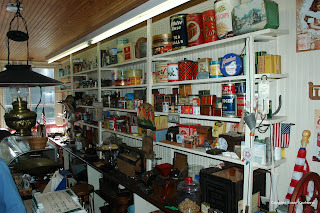 Other baseball and cow-related memorabilia are displayed on the wall and museum cases, many of them gifts from Phil or his wife Cora. I'm a Met fan, but I found the museum to be both informative and fun, so I imagine that Yankee fans would enjoy it a lot. Don't be a huckleberry - check it out sometime! Two are located in Ringwood, guarding the entrance to Skylands Manor, which is where Ivan and I found them this past weekend. Gotta love it when our interests converge. Why are these raptors so darn big? Some odd breed? Perhaps escapees from an updated Jurassic Park? Not quite. The Skylands eagles are among the last remnants of the old New York Pennsylvania Station, which was demolished in 1963 to make way for the new Madison Square Garden. The passageways and corridors beneath the Garden are still considered Penn Station, of course, but they're in no way equivalent to the grand marble structure that once stood there. Based on the Roman baths of Caracalla, the old station stood majestically on Seventh Avenue at 34th Street, with 14 large marble eagles and a host of smaller ones perched high above at strategic positions. When the original station was pulled down, the Pennsylvania Railroad was inundated with requests for the eagles. Two found homes in front of the new Penn Station, but no markers explain their history, leaving me to wonder if anyone makes the connection. Another is at Cooper Union in Lower Manhattan. Others are at train stations, and four even grace a bridge in Philadelphia. All of the large 14 are accounted for, according to this informative website, but the eight smaller ones, well, no-one is sure where they are, apparently. These aren't the only vestiges of the old Penn Station to rest in New Jersey. Some of the other statuary atop the station were rescued from a landfill and brought to Ringwood State Forest. I seem to recall seeing them there several years ago, still resting in pieces waiting to be reassembled, but now they're being kept at a New Jersey Transit training facility in Newark, as reported on this website. Other, less artistically-important pieces of the Penn Station facade remain in the same less noble resting places they were carted to nearly 50 years ago. Intrepid writer and explorer Robert Sullivan wrote about his own search for Penn Station in New Jersey in his informative and entertaining book The Meadowlands. He tells the story a lot better than I ever could, but he ultimately found several Penn columns in a truck yard off Penhorn Creek in Secaucus. It is true, it seems: whatever you can think of is or was, at some point, carted to the Meadowlands. Anyone else getting the idea for a Hidden New Jersey trip to Secaucus? Back in the days before suburbanization, when a company built its manufacturing facilities in the countryside, it had to consider where the factory's workers would come from. There generally wasn't enough suitable labor locally, so the company would take on the role of developer and landlord and build a whole town for the workforce it would recruit from elsewhere. The typical company town would spring up just outside the factory gates: company-owned housing, stores, schools, fire and police protection, you name it. The John A. Roebling's Sons company took this approach in 1905 when locating its new steel mill on the banks of the Delaware River south of Trenton. Today, the factory is gone, but many of the buildings and homes still stand in the tidy community of Roebling. Using a map provided by the Roebling Museum, I took a walking tour of a five-block by two-block section of this neat little enclave, which is now a part of Florence Township. 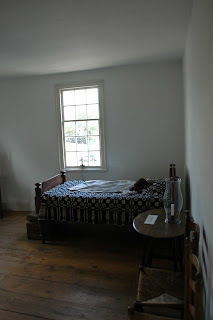 During my visit to the museum, I'd learned that the living conditions and rules for the Roebling community had set it apart from many other company towns. First, the housing was constructed under the basic premise that workers and their families deserved decent and modern homes. A variety of brick structures was available depending on a worker's family situation: a 'bachelor hotel' for unmarried workers, row housing for couples and small families, duplexes and single-family houses that were mostly reserved for middle and upper management. Each was equipped with full plumbing, electricity and gas, which was unusual for the area at the time. The museum docent explained that the size of the home didn't necessarily equate with the employee's status in the company. One laborer, for example, had 13 children and was provided with a larger house to accommodate them. At first, where you lived was also determined by your ethnicity. The company actively recruited recent immigrants from Central Europe, so you would see a Hungarian enclave, a block of Lithuanian families, and so on. That practice changed over time as youngsters of different backgrounds met, got married and had their own families while remaining in town, working at the factory as their fathers did. is now a deli and convenience store. The company store still stands as a small market and deli in the center of town, not far from the statue of Charles Roebling that was dedicated just a few years ago. Unlike the usual practice in similar towns, however, factory employees were paid in cash rather than company scrip, so they were able to buy their food and other staples anywhere they wished. Two things Roebling didn't have were churches and drinking establishments, but residents didn't have to go far to satisfy their thirst for salvation or distilled spirits: literally just across the railroad tracks at the edge of town, are seven houses of worship and 14 bars. Today, community pride is clear from the tidy lawns and well-cared for exteriors of the homes and public buildings. When I visited on a sunny weekday afternoon, a few people were out and about, but mostly, it was very quiet, with little traffic on the streets. No doubt, most residents were at work or school, and the streets would get busier at late afternoon. It wasn't hard to imagine that 50 or 100 years ago, the residential area would have been enveloped by the not-so-distant noise of the Roebling factory in action. If you blocked out the modern cars from sight, you might even be able to envision workers streaming down the main road from the factory gate at quitting time, making the short commute to their homes. I needed to make the reverse walk to get back to my car, which was parked inside the factory gates beyond the museum. On the way, I passed a small vestige of the days when the whole town was privately owned: an otherwise easily-overlooked obelisk that once held part of a chain that blocked the street from traffic one day a year. It's a little-known fact, but in most jurisdictions, if you allow the public to use part of your private property as a thoroughfare for 365 consecutive days, it reverts to the public domain. Thus, to retain property rights to the road system, Roebling would block off the town's streets for one day per year by stringing lengths of rope (made from Roebling wire, of course) between obelisks like the one in the picture to the right. Rockefeller Center management used to do the same thing with the drive between 30 Rockefeller Plaza and the ice rink, usually on Christmas or New Years, I think. Pretty wild, eh? Check out more photos of Roebling and the museum on our Facebook page! I'll make it to Burlington someday. I swear. Ever since our visit to the provincial capital of East Jersey, Perth Amboy, I've wanted to see its West Jersey counterpart, Burlington City. For one reason or another (Turnpike issues, birding imperatives elsewhere), we just haven't made it, and I figured I'd take one of our recent beautiful weather days to make the drive while Ivan was occupied with a client. Then I saw the brown sign for Roebling. You know what those brown signs mean: there's something interesting there. Follow that sign, leave Route 130 and cross the railroad tracks, and you land at the site of the former Roebling steel mill. It's an interesting vision: on one side, you see a fenced-in expanse of grass with what looks like two parallel monorail tracks high above ground, and some industrial equipment beneath. On the other side, you see construction trailers and a large expanse of disturbed earth. In the middle, there's a parking lot for the Roebling Museum, punctuated by an old green wooden building. The museum itself is at the top of an incline, as if to tower ever so slightly above the field below. There's a good reason for that, I discovered. The museum building was originally the Roebling factory gatehouse, holding several different functions including a first aid station and a three-cell jail. I was welcomed in by two very friendly docents who were more than happy to guide me through exhibits outlining the Roebling family, evolution of their company and the factory, and the adjoining town. You might recall that earlier this year, Ivan and I visited one of John Roebling's early bridges, the Delaware Aqueduct spanning the Delaware River between New York and Pennsylvania. Town residents are justifiably proud of that span as well as the several more famous bridges containing Roebling wire: the George Washington, Manhattan, Verrazano Narrows and Golden Gate, among others. My guide pointed out that as an engineer, John Roebling designed and built a then-unique bridge over the Niagara River which conveyed trains on a top deck and horses and carriages on an underdeck. Had it not been rendered obsolete by changes in railroad technology, it might still be in use today. Bridges, however, were only one use of Roebling products. Both the Wright Brothers airplane and the Spirit of St. Louis contained Roebling wire. Otis elevators were suspended by Roebling steel cables specifically designed to handle the unique stresses of pulleys and loads of varying weights. 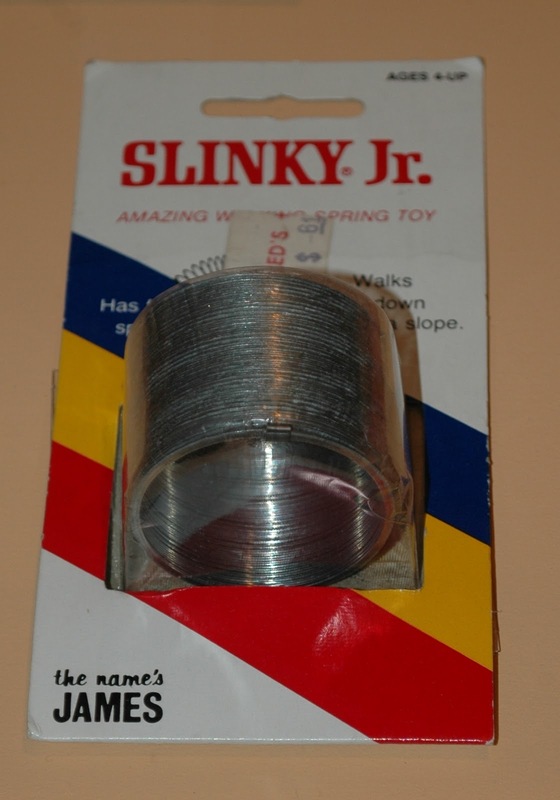 Remember the Slinky? Yup -- made from Roebling wire. Essentially, if you needed extruded steel, Roebling could and often did supply it, in gauges down to the width of a human hair. I'm getting ahead of myself, though. To supply the wire rope for the bridges, the Roebling family established a steel mill-factory complex in Trenton, based on the recommendation of a friend who lived nearby. Soon, however, they'd expanded beyond the capacity of the property and needed another location. The village of Kinkora, about ten miles south of Trenton, was just the place -- close to the Pennsylvania Railroad and the along the shores of the Delaware River. The company bought three farms there in 1905 and got to work. Along with a state-of-the-art manufacturing facility, the Roeblings built a company town to house the substantial workforce needed to operate the factory. I'll get into that in our next installment, but I'll say that the museum exhibit gives a great view into who worked at the plant and life in the village during the factory's heyday. You can also pick up a self-guided walking tour if you'd like to get a closer view of present-day Roebling. The family sold the mill to Colorado Fuel and Iron in 1952, and it stayed in operation until 1974. Now only a few small buildings are still standing. Declared a Superfund site in 1983, most of the area has been remediated, though the Army Corps of Engineers is still on site, explaining the construction trailers I saw. In all, the Roebling Museum tells an interesting story of American industrialism and its impact on both society and the people who worked there. I was particularly impressed by how well the information is presented, both in the exhibits and by the docent. They also host a series of special events; the next will be a lecture and tour of the town on October 15. Oh, and when you go, be sure to check out the massive flagpole next to the guardhouse. You can't miss it: it's the third highest flagpole east of the Mississippi. Drive through the Pinelands any weekday in October, and there's a fair chance you'll run into a cranberry harvest. New Jersey is third in the nation in cranberry production, and it's still done the old-fashioned way: flood the fields, let the berries rise to the top and scoop 'em up. I happened upon a harvest crew on County Route 563 outside of Chatsworth last fall and stopped to check it out. A trio of cab trucks with big bins on the back, parked on an earthen berm right next to the side of the road. As I got closer, I saw the conveyor belt and the glistening of wet cranberries floating within the confines of a big yellow floating boom. Workers in hip waders were shaking the submerged berry bushes with the tools of the trade, then pushing the crop with wooden boards to the end of the conveyor, where they were scooped up and ultimately dropped into big crates on top of the trucks, where another worker used another board to distribute the load evenly. Water streamed from the bottoms of the crates, having been transported up along with the berries. This was all happening within feet of the edge of the road, as if it were some sort of demonstration arranged by the tourism bureau. It was like one of those Sesame Street segments on how food gets from the farm to the supermarket. Who could resist stopping to take pictures? In fact, someone else already had. I pulled to the side of the road and rolled down the window to grab a few shots. I felt a little weird about stopping just to watch other people work, but the crew seemed okay with it and even waved over when they noticed I'd stopped on the opposite shoulder. Stepping out of the car, I crossed the two-lane road to get a better view. As one truck would be filled with berries, the worker atop would jump down and wave the next truck into position as the laden truck drove off and hook around to the county road to drop its load at the main barn. Meanwhile, the workers standing waist deep in the bog would keep the crop coming through the conveyor as long as a truck was beneath to catch it. It was a well oiled process, and it struck me that in essence, it probably hadn't changed in years. Maybe the conveyor was faster than an old one, or the booms were sturdier rubber, but there were no computers, no outsourcing to cheaper labor thousands of miles away. Other people stopped and got out of their cars from time to time as I watched the crew, and to a person, they all had broad smiles on their faces. We exchanged greetings and brief statements about craving cranberry muffins or expecting to see the two farmers from the Ocean Spray commercial, but mostly, we were all taken in by the beauty of the tableau before us. The blue sky reflected in the flooded bogs, contrasted by the yellow boom and ripe red cranberries. Feeling the warmth of the sun, and the anticipation of Thanksgiving turkey and cranberry sauce, I just stood there with a dumb grin on my face. Chatsworth is center stage for the cranberry industry in New Jersey, and they celebrate the annual harvest with a cranberry festival. This year, it'll be on October 15 and 16. I haven't checked it out yet, so I can't give you a recommendation one way or the other, but it seems to me that if you like cranberries, it'll do just fine! Sandy Hook's Cold War-era Nike radar base is one of the many fascinating parts of Fort Hancock, and I've taken a few of the biweekly tours held during the spring and summer months. The big mystery for me has always been the launch site several thousand feet away, which is rarely, if ever, open for tours. Why two separate sites? Well, logistics and safety played a big role in separating the firing of these radar-guided surface-to-air missiles from the actual launch. The control center tracked potential targets and any missiles that were aimed at them, and the launch site was where the missiles were stored and would be set up and fired if needed. Given the speed of the supersonic missiles, on-site radar could only acquire and track a launched Nike from more than a mile away, and, of course, there was always the danger of portions of the rockets falling on the base or exploding during ignition. The Nike program was decommissioned in 1974 after the advent of intercontinental ballistic missiles made them obsolete, and Sandy Hook's Fort Hancock was relinquished to the National Park Service not long afterward. Now part of Gateway National Recreational Area, the launch site is used primarily for maintenance vehicles, its barracks used for storage. The gate's usually open, but a sign warns visitors that the site is for staff only. Stand at the entry, and you can see a cracked macadam road reaching toward the beach beyond, obscured by shrubbery. The only real signs that this was a secure area are the guard shack at the entry and the Nike Hercules missile that's parked up front. Well, and the barbed wire. Curious after finding the area on some aerial shots of the Hook, I once tried to get to the launch site from the beach side. All I could see above the dunes was barbed wire fencing and some old, busted flood lamps. The ground above was level and I noticed a hole in the fencing, but I wasn't taking my chances. 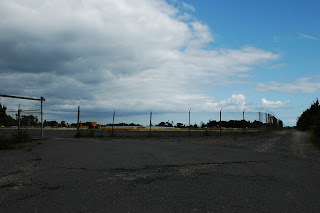 My curiosity was settled a few weeks ago when the Sandy Hook launch site was opened for rare guided tours with Nike base veterans. Ivan was on a major birding quest out of state, leaving me to explore my own obsessions, and what's more interesting than getting into restricted space? I hopped on down for a quick jaunt through the radar site, and after what seemed to be an endless wait for the first launch tour to return, I was on my way with a large group of visitors. The veteran on site was joined by the park historian, who gave an exhaustive explanation of the cold war as we stood looking at the business end of the nuclear-capable Hercules. Let's go, folks -- I wanna see the secret area! Noticing that some of us were getting restless, the veteran took a group of us up the hill to the launch site. Along the way, he pointed out two more guard shacks and explained that each launch site had been ringed by three separate barbed wire fences, with a shack at the entrance to each. Sentries and dogs patrolled the perimeter, and the vet said that the dogs were trained to attack with force. Had he been given the choice of being shot or having the dogs let loose on him, he said, he'd go for the bullet wound. Much less painful, much less harmful. Fort Hancock had four underground missile storage areas arranged in a square atop the hill, with elevators that lifted the missiles in a horizontal position. 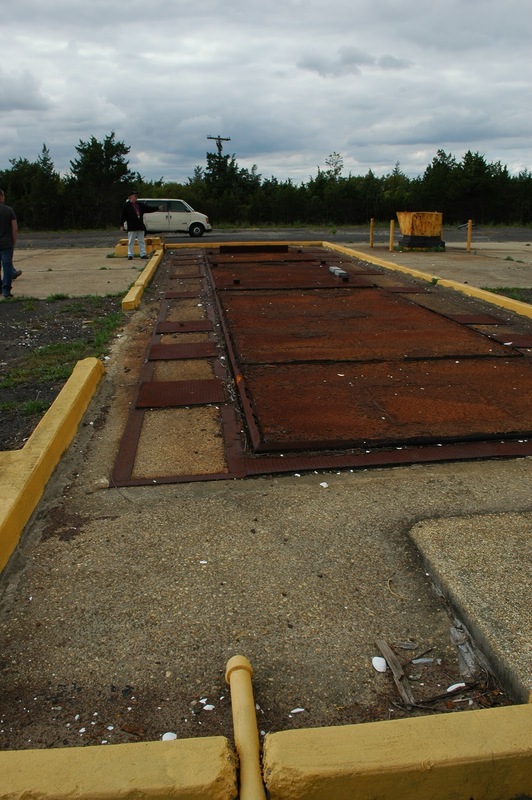 Once at ground level, soldiers would push a missile into place on the blast pad, all four of which are still visible. No missiles were ever fired at the base, but practice was a regular occurrence, and when they were called, the troops there never knew if they were going to a drill or experiencing the real thing. We only saw the surface area because the underground portion of the base is flooded and accessible only through four manholes and of decaying metal ladders beneath. All of the elevators that lifted missiles to launch have been moved to their highest positions and are now apparently stuck at surface level, with any hope of restoration being many years in the future. However, the vet told us about a restored base in the Marin Headlands above San Francisco and some footage of its workings that give you a good idea of how it all looked in its prime. I'll wager that since the Park Service has already spent the time and money on restoring SF-88, it's unlikely they'll do the same at Sandy Hook, but I'm sure if the local vets want to make the effort, they'll be more than happy to support it. A few weeks ago, I wrote about our random jaunts on the Appalachian Trail, all the while forgetting about the mammoth Maine-to-Florida path that passes within yards of my front door. Yes, there's a north to south walk and bikeway that's mapped right through suburbia and the heart of some of New Jersey's largest cities. 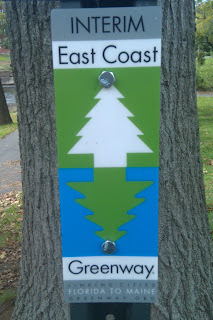 The East Coast Greenway was conceived in 1991 as an urban sister of sorts to the AT, enabling walkers, runners and users of non-mechanized vehicles to enjoy a safe excursion. 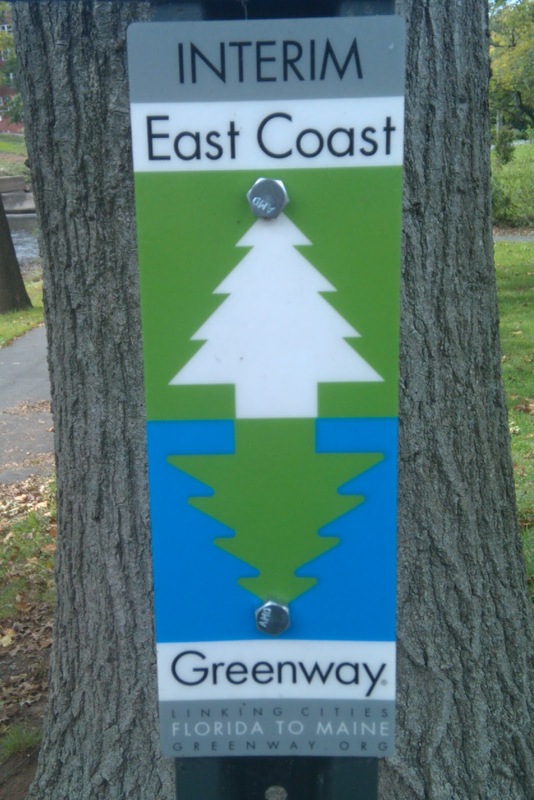 By linking many local trails, the ECG gives users the path to experience local attractions for a day or maybe even an extended jaunt through a given state or region along the way. A fair amount of the route is already established, but the alliance managing the Greenway is still working to settle links that will bring users out of overly trafficked or heavily-used areas. As it stands, certain urban portions may not be as safe as desired for inexperienced cyclists or wheelchair users to traverse. Remember that part of Forest Gump where the title character decides to start running one day -- and ends up on a two year journey? Ivan and I indulged that concept a little Saturday morning as we were walking back to my place after breakfast. Seeing the Greenway blaze on a utility pole, he suggested that we follow the path and see where it goes. A mile and a half later, we'd walked through my neighborhood to a nearby river, crossed a large county park and forged on to the main drag in the next town. Along the way, we both wondered whether we could walk the entire New Jersey section of the path in a weekend. I'd seen some flyers about a 50-miles-in-a-day Greenway event last spring, but that was for cyclists and didn't cover the stretch between Trenton and Edison. What about walkers and hikers? What would we do, and how long would it take? If the path goes through towns and cities, we wouldn't have to carry much in the way of food and water, and we could find hotel rooms for the overnights. Heck, we could even stay at my place one night if we planned properly. Checking out the New Jersey trail map, we discovered the state section is 78 miles long, from Trenton to New York City, but a portion of that actually routes you onto the PATH train from Newark to Jersey City. Additional alternates will take you up to 93 miles, ending at the George Washington Bridge. I can only guess that the rail portion is there until they can figure a route that gets you between the cities without sticking you onto impossibly congested roadways, but still, it seems kind of silly that a path puts you on a train, even if it's a PATH light rail. Rails to trails, indeed! Still, though, taking to the ECG for a weekend or more is an intriguing concept for us. What kinds of Hidden New Jersey could be nestled along the way? Stay tuned... this idea may have legs.